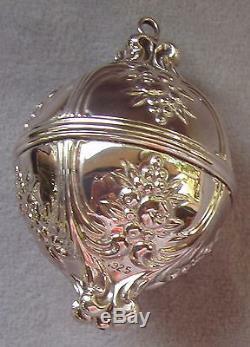 2006 Reed & Barton Sterling Francis I Sphere Ornament. Francis I Pattern 100th Anniversary. 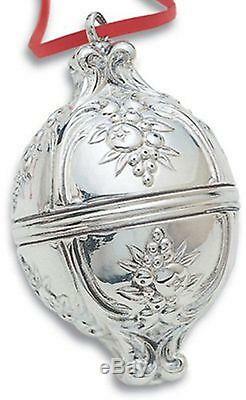 The 2006 Francis I Christmas Ball celebrates the 100th anniversary of Francis I sterling silver, making it a special addition to any holiday ornament collection. This glorious sculpted sterling collectible bears an intricate fruit and flower motif inspired by the Francis I sterling flatware pattern. The meticulous detail and artistry of this uniique ornamental sphere make this sterling collectible a true treasure. This is a large ornament measuring 3 1/2 inches long by 2 inches wide. This is in new condition, complete with the original clam case, outer sleeve box, romance card, and anti tarnish pouch. As a result, the following series are no longer in production: Sterling Angel, Santa, Williamsburg and Pierced Cross as well as the Silverplate Cross and Snowflake. The Lunt label has been totally eliminated. If by some small chance your item is not satisfactory, your return should still be received within 7 days or less. Be sure to check my other listings for many Christmas sterling pendant /medallion / ornament / charms, and other great gift items, Victoriana, Elegant Glassware, Vintage Clothes and Shoes etc. Thank you very much for your interest. I look forward to doing business with you! 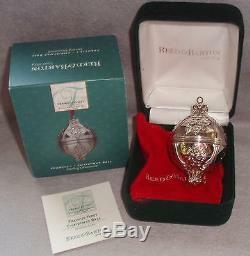 The item "NIB Reed Barton 2006 Sterling Silver Francis I Christmas Ball Sphere Ornament" is in sale since Tuesday, September 04, 2012.